Rated 5 out of 5 by blipi69 from Great Game I enjoyed this HOPA very much. Good riddles and nice graphics. I recommend the game. Rated 5 out of 5 by megwoman25 from More Like This Please!!! It's not very often I play a game and absolutely love it but this is one of those games. I am a sucker for a good whodunit game and this one is out of this world. You are investigating a death in the family and are invited to the estate to help solve the murder. You are a medium of sorts since you can see ghosts and are able to read their auras. I really liked this part of the game because you learned tidbits of information pertaining to each person in the game and learned all about their dirty little secrets. You also have a fingerprinting kit which you use on various items around the estate to figure out who the murderer is. There are a lot of suspects and I was not quite sure who did it although I had a guess but no idea the motive. You find out who did it and the motive which was kind of cool how it all got pieced together. The graphics are great. 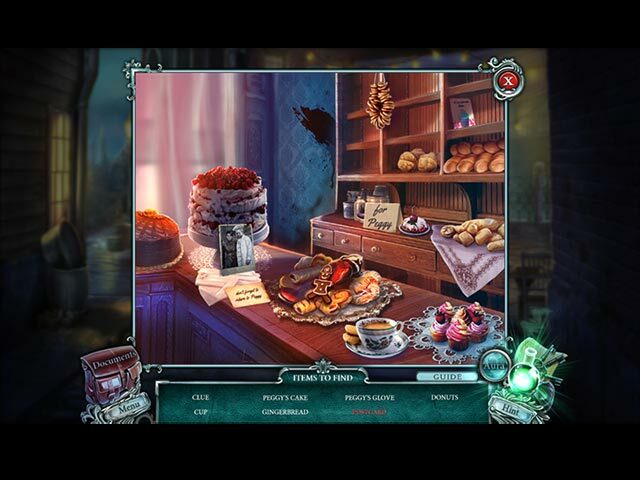 The hidden object scenes are interactive and fun to find the objects listed. There are different kinds of scenes. IF hidden object scenes aren't your fav, then you can switch it to match 3. The puzzles ranged from really easy to moderately challenging although they were all doable in my opinion. The only collectible are pictures that morph of the different characters. I apparently missed some and I am not sure how...they really do pop out at you so they are not hard to miss..or so I thought... The bonus chapter had nothing to do with the main game and was quite short. In fact I think it took me less than 45 minutes to complete it but it kept my attention enough to keep playing it so that's a plus. Also, the morphing pictures keep going into the bonus chapter. The main game ended well and did not have a cliffhanger so if you don't care about extras, the standard edition would end just fine and you would not miss out on anything. My only issue with this game was how incredibly SLOW it ran on my computer. However, I do not know if this was the game OR my computer, as my laptop was not meant to play large file games and sometimes freezes or shuts down. Although this game never froze or caused my laptop to crash, it did run slow enough that when clicking dialogue or going scene to scene, I did think from time to time that it froze but it just lagged a bit. Usually this would be a deal breaker for me but like I said before, I am a sucker for a good whodunit game and I loved this one to bits. I wish there were more engaging games like this. Lately I haven't quite liked many games on the market because its the same stuff over and over again. This game although similar to others was a bit different and I appreciated that as well as a new series! I am a bit sick of playing game 10 in a series as by then the series is stale! This was refreshing! More like this please! Kudos! I definitely recommend! 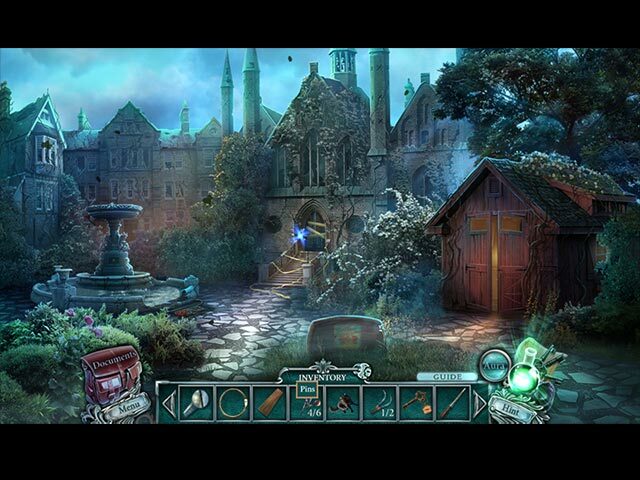 Rated 5 out of 5 by Deejaycee522 from A different kind of HO game The object of this game is all about collecting evidence to determine who had a motive for murdering the patriarch of the Maybard family. It is a HO game, but a little more interesting because collecting hidden objects is only part of the game play. You have to question everyone who visits or lives in the mansion to find out their relationship to the family. You also have to determine who were friendly and who were enemies. What takes place in this game is similar to what happens when a police officer questions a suspect. I think it is a good game. I bought the collector's edition. There is a hint button and a teleporter that takes you to another location in the game. The graphics are great. The music is good. There is lots to do in this game and I found it to be challenging. Rated 5 out of 5 by puzzlewhacky from Excellent Hidden Object Game This game had me when I played the demo, in fact I emailed BF to inquire when it would be released. So, I have been anxiously awaiting the release and much to my delight it was and I purchased it right away. I have just finished this game and I really liked how immersed I got. I cannot find anything negative about this game, it is quality all the way Thank you BF, it is a pleasure to play and enjoy. Rated 5 out of 5 by Reneenct from Liked it so much I played it twice This game has a great murder mystery plot with lots of twists and turns. It seems that nearly everyone has a motive while the culprit is slowly revealed. The only draw back to the story is that the detective communicates with ghosts, so that took the story down a notch for me. The puzzles, both HOGs and mini games are very doable and some were actually fun. The art is very nice with no dark and dreary scenes dripping with death and decay. It takes place inside a mansion and most scenes have a cozy pleasant feel. Some of the voice overs were a little saccharine but that was easily skipped. It's rare that I like a game enough to play it twice but this was worth it. Bring on Cursed Cases 2. Rated 5 out of 5 by Howatch from I don't understand.... some of the lackluster reviews that this game is receiving, as I am finding the game thoroughly entertaining. The "gimmick" which some folks in their reviews are referring to is of such brief duration that in my opinion it does not detract from the game much if at all. I have played this game for several hours today and am finding that it is also of a good length. The mini-games have been fun and I have only had to skip a couple of them so far - I enjoy mini-games, but sometimes I get frustrated with them if they seem too obtuse, which is not the case here. The game also has an interesting story which I am actually enjoying, and wanting to know how it all turns out is also a factor in my interest being maintained throughout the game. All in all, I think this is an excellent offering on the part of this developer. I think it is actually a better game than some of the more recent offerings which have received higher ratings. So, I encourage you to give the game a try and see what you think. You can choose to play a male or a female character, although there is no voiceover for you, the detective. I do think that if there had been a spoken voice for your character that it would have made the game even more compelling, but that is a minor complaint/observation. 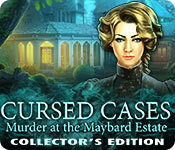 All in all, it's a fine game, and I will look forward to the next installment of Cursed Cases. Rated 5 out of 5 by skullfun from ~~~~This is a murder mystery you don't want to miss!~~~~ Wow! Daily Magic Productions, the creative minds behind Dark Dimensions and Sable Maze, delivers another high-quality HOPA series. This time, as a top detective, it's up to you to solve the strange murder case of the Maybard family? Yes, Emmett Maybard has been murdered. Your powers of investigation include Aura powers of deduction which gives you the ability to see ghosts. You also must dust inventory items to collect fingerprints to eliminate a whole host of potential suspects....Who actually did kill Emmett? Was it.. Grace Maybard (the wife) Charles Maybard (the brother) Rutherford (the butler) Beth Dwyer (the Nanny) Dahlia Maybard (the daughter) Isobel (Emmett's lover) Sophia Maybard (the sister) Fredrick Llang (business associate) Bartholomew Murphy (the family lawyer) All of the suspects are really interesting characters. It's story is incredible; a suicide, a bloody hammer, a business deal that results in bankruptcy, a family member who walks in their sleep, and the last will and testament of Emmett Maybard!!! The developers have created a thrilling journey that is extremely engaging and impossible to predict. I give Cursed Cases the highest rating based only on this adventure and not comparing it to their other releases or developers of similar games. This was a must purchase for me and I hope more editions of this series come to Bigfish! Rated 5 out of 5 by kerik79 from Very Clever Indeed! Based on the demo, I will be purchasing this game. I can't remember the last game I found this exciting! Winning combination of a murder mystery/supernatural combo. 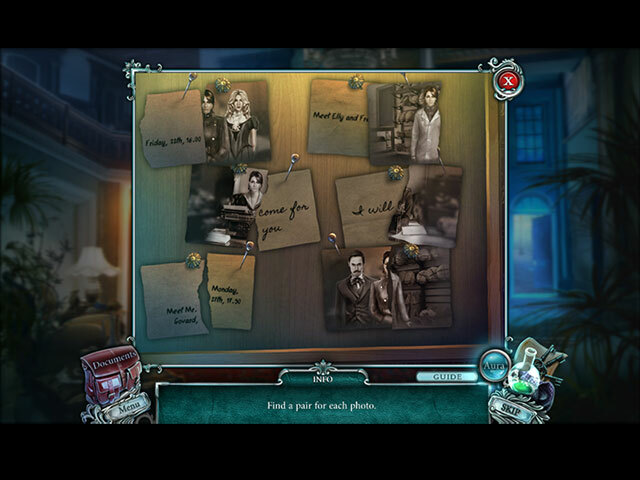 You play as a detective with special powers that allow you to find extra clues hidden within scenes and objects. The storyline really excels here, making excellent use of deductive reasoning within the game. The graphics and sounds are topnotch, the puzzles are unique and challenging, and the story is intriguing. Any whodunnit fan will find this mesmerizing! That is my preferred genre, over the evil, dark games sometimes featured, and I would say that this is in the top of its class. I really found myself trying to work out the story to figure out who the killer is, making judgements about each character's alibi and, at the end of the demo actually gasped out loud! Couldn't believe I had already played for an hour and was absolutely hooked!